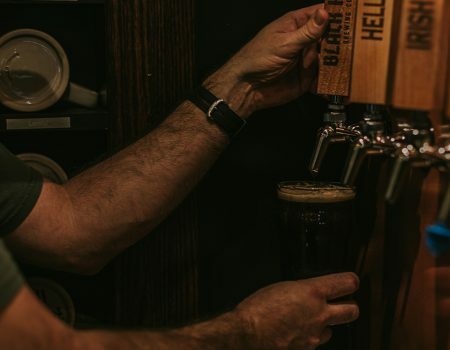 At Black Hoof, we brew a variety of beers with an emphasis on traditional, true-to-style German lagers and European ales. Our tap lineup is constantly changing and evolving to include beers for each holiday and season. We offer a warm, inviting taproom, delicious brews, and friendly, knowledgeable staff. We hope our hard work, attention to detail and passion for brewing in the traditional style is evident in each and every one of our beers. Can I bring my dog into the taproom? We do not allow dogs who are not registered as service animals in our taproom. However, during warmer months, we have a roped-in front patio where dogs are more than welcome. Make sure to ask about our Hoof Print dog treats! Children are more than welcome to join you at Black Hoof. We offer juice, milk, water, and lemon soda, as well as Bavarian pretzels for kids (and adults) to snack on. We also have numerous board games and coloring books to keep the whole family entertained. We will fill any growler up to 128 oz. for consumption off premise. Price of growler fills vary depending on the beer. We also sell 64 oz. glass growlers and DrinkTanks in the taproom. 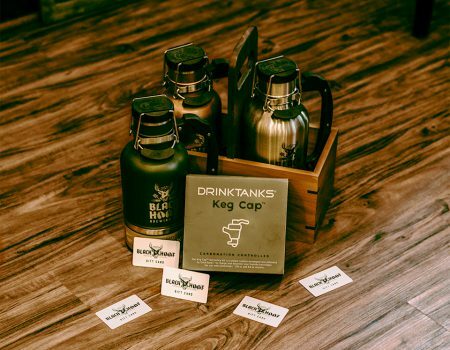 Do you sell kegs for private events? We currently do not sell kegs for private events. We do not take reservations. However if you are expecting a large party of 12 or more, please call ahead and we will do our best to accommodate your group. How do I order a beer? We offer bar service rather than table service in our taproom. You can feel free to grab a seat at any table, but make sure to come up to the bar to order. You can also hang out up at the bar or on our front patio, as long as you stay within the ropes. why don't you have barstools? 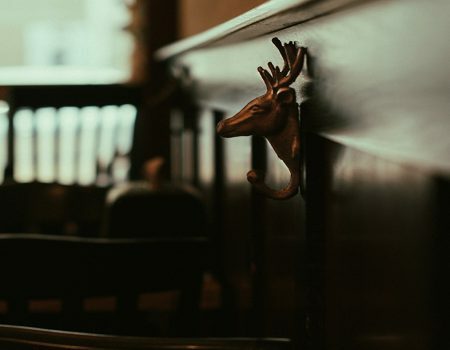 Our bar doesn’t have bar stools because we want to encourage a friendly atmosphere between customers. What’s better than grabbing a beer and standing next to a total stranger who turns out to be extremely interesting? 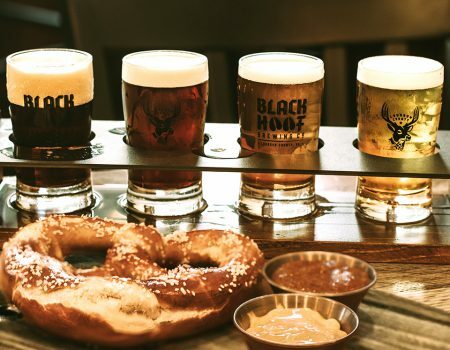 Can I find Black Hoof beer anywhere besides the brewery? As of now, we do not distribute outside of the brewery. Does Black Hoof bottle or can any beer? Currently, we do not bottle or can our beers, but we will fill growlers for offsite consumption. You can either fill out our form under “Book a Private Event” or contact mike.cales@blackhoof.com to book and set up your event. Depending on the desired day of the week and time of the event, we may not be able to honor all requests. Monday through Thursday before 11:30 am and Sunday evenings after 6:30 are much easier for us to book, because we are closed to the public at those times. Does black hoof have outdoor seating? During warmer months, we offer a roped in front patio with standing tables. You may bring your beer outside as long as you stay within the ropes. Smoking is permitted on our patio, but please be courteous to other customers! Does Black Hoof have food? We offer warm, soft Bavarian pretzels, which are served with Obatzda (traditional German beer cheese) and sweet German mustard. However, you are more than welcome to bring in outside food or have food delivered. 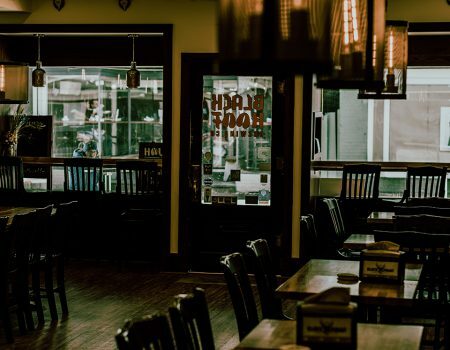 There are tons of great restaurants within walking distance that offer takeout, just ask your bartender for menus from some of our favorite local spots! Where can i find black hoof on social media? Due to our limited space, we do not currently host live music outside of special events. Downtown Leesburg offers numerous parking options, both on the street and in public garages. We do not have a designated parking lot, however, the parking garage between Market St and Loudoun St is located just behind Black Hoof, conveniently through a walkway adjacent to the brewery. Is Black Hoof handicap accessible? The front entrance to our pre-Civil War era building has a short step up from the curb. Our taproom area and restrooms are fully adapted to ADA standards. What's with the different glasses for different beers? 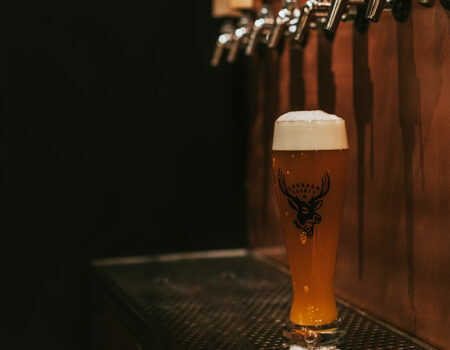 At Black Hoof, we pride ourselves on serving our beers in the most appropriate glass for the style. Glassware has a significant influence on the beer drinking experience, and we hope that each and every beer we served is enjoyed to its fullest potential. What are the mugs on the wall for? The mugs on the wall adjacent to the bar are part of our Mug Club. Members of our Mug Club enjoy special perks such as early release beers, Black Hoof swag upon signing up, special events, member exclusive newsletters, and discounted tickets for ticketed events. To become a part of our Mug Club, guests pay a set price each year to “rent” a spot on our mug wall. Members may pick their own mug names, which can be changed at any time. At the end of the year, members may choose to renew or take home their mug and open their space up for a new member. Can I buy a Black Hoof gift card? Absolutely! We can sell gift cards of any amount both in our taproom and online. What does Black Hoof do for first Fridays or downtown events? We are open for all Downtown Leesburg events including First Fridays, parades, and festivals. Check our updates page for special hours as we may open early for larger downtown events. We do not offer scheduled tours of the brewery at this time. But if you are visiting Black Hoof and wish to take a look at the brewery, just let one of our bartenders know. If we aren’t too busy, we’ll be more than happy to show you around! How do I find out about holiday hours? We will post any changes in hours for holidays or events on our Facebook page and our Updates page.